Harvard University is a private Ivy League research university in Cambridge, Massachusetts, established in 1636. Its history, influence and wealth have made it one of the most prestigious universities in the world. 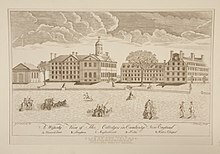 Established originally by the Massachusetts legislature and soon thereafter named for John Harvard (its first benefactor), Harvard is the United States' oldest institution of higher learning, and the Harvard Corporation (formally, the President and Fellows of Harvard College) is its first chartered corporation. Although never formally affiliated with any denomination, the early College primarily trained Congregation­alist and Unitarian clergy. Its curriculum and student body were gradually secularized during the 18th century, and by the 19th century Harvard had emerged as the central cultural establishment among Boston elites. Following the American Civil War, President Charles W. Eliot's long tenure (1869–1909) transformed the college and affiliated professional schools into a modern research university; Harvard was a founding member of the Association of American Universities in 1900. James Bryant Conant led the university through the Great Depression and World War II and began to reform the curriculum and liberalize admissions after the war. The undergraduate college became coeducational after its 1977 merger with Radcliffe College. Harvard was formed in 1636 by vote of the Great and General Court of the Massachusetts Bay Colony. It was initially called "New College" or "the college at New Towne". In 1638, the college became home for North America's first known printing press, carried by the ship . In 1639, the college was renamed after deceased clergyman John Harvard, who was an alumnus of the University of Cambridge. He had left the school £779 and his library of some 400 books. The charter creating the Harvard Corporation was granted in 1650. Harvard's 209-acre (85 ha) main campus is centered on Harvard Yard in Cambridge, about 3 miles (4.8 km) west-northwest of the State House in downtown Boston, and extends into the surrounding Harvard Square neighborhood. Harvard Yard itself contains the central administrative offices and main libraries of the university, academic buildings including Sever Hall and University Hall, Memorial Church, and the majority of the freshman dormitories. Sophomore, junior, and senior undergraduates live in twelve residential Houses, nine of which are south of Harvard Yard along or near the Charles River. The other three are located in a residential neighborhood half a mile northwest of the Yard at the Quadrangle (commonly referred to as the Quad), which formerly housed Radcliffe College students until Radcliffe merged its residential system with Harvard. The Harvard MBTA station provides public transportation via bus service and the Red Line subway. The Harvard Business School and many of the university's athletics facilities, including Harvard Stadium, are located on a 358-acre (145 ha) campus opposite the Cambridge campus in Allston. The John W. Weeks Bridge is a pedestrian bridge over the Charles River connecting both campuses. The Harvard Medical School, Harvard School of Dental Medicine, and the Harvard School of Public Health are located on a 21-acre (8.5 ha) campus in the Longwood Medical and Academic Area approximately 3.3 miles (5.3 km) southwest of downtown Boston and 3.3 miles (5.3 km) south of the Cambridge campus. A private shuttle bus connects the Longwood campus to the Cambridge campus via Massachusetts Avenue making stops in the Back Bay and at MIT as well. First we determine your award by establishing your parent contribution. Then we factor in student employment and any outside awardsyou’ve received. Your remaining need will be covered by scholarship funds. These awards come from a variety of sources, including Harvard endowment funds, gifts from alumni, general tuition revenues, and federal and state grants. The Faculty of Arts and Sciences Scholarship program includes more than 1,500 individual endowment funds, established by generous alumni and donors, including a transformational gift from Ken Griffin ‘89. In recognition of their important legacy, we report to many of them annually using the information students share with us over the summer. When you receive scholarship assistance, you may be asked to write a thank-you note to your scholarship donor. If you are a U.S. citizen or permanent resident, you may be eligible for a Federal Pell Grant or a Supplemental Educational Opportunity Grant (SEOG). Your eligibility is determined by the information you provide in your Free Application for Federal Student Aid (FAFSA). Pell Grants and SEOG are awarded by the federal government and administered by our office, based on financial need. Within 10 days of filing your FAFSA, you will receive a Student Aid Report indicating your eligibility for a Pell Grant. Of the roughly 6,600 current undergraduate students at Harvard College, 16% are Pell Grant recipients. If you are a Massachusetts resident, you may also be eligible for a state Gilbert Grant, which is awarded on the basis of need. These awards do not affect your term-time work expectation.